In 1980 I wrote a fifteen-minute film script about a subject most people give little thought to: sand dunes. The stars of this natural history documentary were sea oats, pelicans, shorebirds, and loggerhead sea turtles. The goal? Show people how important sand dunes are to wildlife and man. Because of scheduling issues and bad weather, however, a vital part of the film never got shot. Sand Dunes: Guardian of the Coast hit the screen without its true stars, child prodigies you could say. And then career changes got in the way. It took a book project, thirty-three years, and a twist of fate to see the end of my own story. Got a few minutes? Go back with me to 1980. Nesting season is almost spent. It’s late August, 10:15 in the evening on Cape Island, the outermost island in Cape Romaine National Wildlife Refuge where the jumping off point is a fishing village known as McClellanville. Above this wild island the Heavens wheel and night takes on incomparable majesty. Far from the diluting effect of city light the sky pulsates with brilliant stars. Meteors streak the sky. The luminous surf rolls then falls, scattering phosphorescent foam across a silver beach. Wherever you look you see no signs of civilization. All you hear are the wind and the sound of life—the rhythmic surge of water. It’s far more than the rising and subsiding of white noise. It’s Earth inhaling and exhaling. Nature rules here. It is an ideal place to film wildlife for a simple reason. Man has yet to ruin it. I’m here to film our next-to-last scene, a loggerhead sea turtle laying eggs along the dune line. For hours we patrol the beach scanning the milky surf to spot the head of a female. Before coming ashore she’ll pause at the surf line to check for predators and if she sees us, back into the sea she goes. To find a turtle already on the nest is ideal and you do that by sitting still and then every so often looking for turtle tracks. If you find a place where it looks like someone has dragged a desk up to the dune line, you’re in business. And so, like some cats out of a Johnny Cash song, we walk the line into the wee hours but see not one sign of a turtle. Eleven, midnight, one, two … the hours crawl by. At 3 a.m. we’re ready to give up. Facing a long cruise through the estuary and then over two hours’ driving to Columbia, we decide to make one more sweep down the beach. And then we see it. A huge scrape mark. Fresh as it can be. Now when you come across a track you have to be patient. You have to give the turtle time to dig a nest and start laying. Once she begins laying you can set up lights and cameras and film away. She won’t budge until the last egg drops. After a reasonable wait we walked up to a massive dune where a turtle was dropping eggs into a hole. Covered with barnacles and shells, she must have weighed 300 pounds. Other sea creatures had hitched a ride on her carapace, and she smelled earthy, organic, of salt and sulfur. The filming went well and we left, resolving to come back and film baby turtles clambering our of the nest and making their way to the sea. We knew that 55 to 60 days her clutch of 120 or so eggs would hatch out. We’d come back when the spartina is golden and the winds bite. That was the plan. Problem is I never came back. I did not get to see the baby turtles claw out of the sand and make their way to the cresting Atlantic where waves swirl them about. It was something that always gnawed at me. A lifetime passed and finally I saw what I missed so long ago. 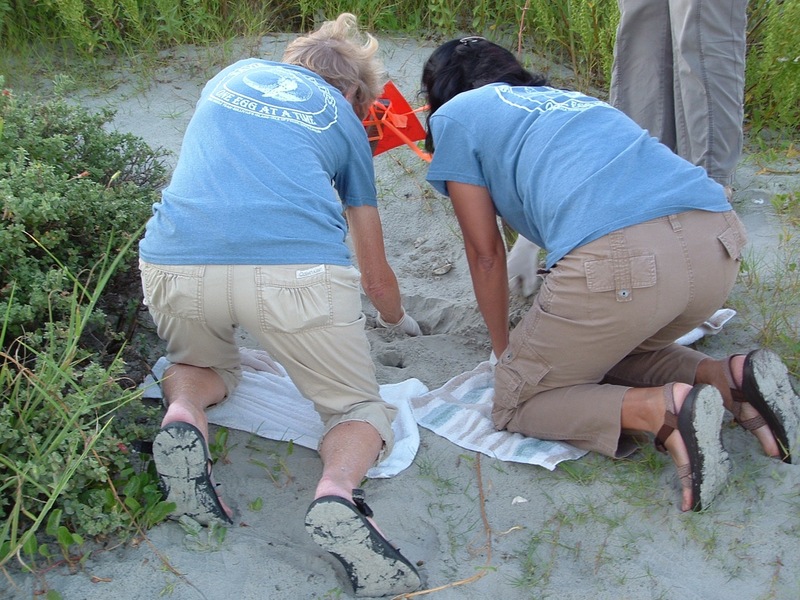 Recently I had the privilege of observing a trained team of volunteers, among them Mary Pringle the project leader for Sea Turtle Nest Protection on Isle of Palms and Sullivan’s Island. Robert Clark and I had a rendezvous at Sullivan’s Island set up by New York Time’s best-selling author, Mary Alice Monroe. 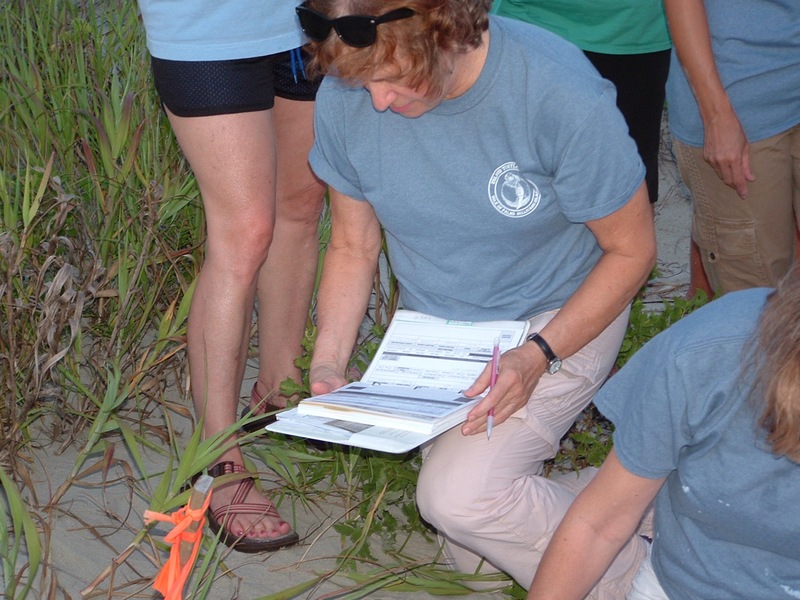 We were there to photograph Mary Alice and the turtle team as they inventory nests to see how many turtles had hatched. Why the big deal over loggerhead sea turtles? Simple. The distinct population segment in the Southeast is a threatened species for many reasons. A major headache for loggerhead sea turtles is finding nesting habitat. Coastal development, predation, folks wandering beaches with flashlights, and accidental capture by commercial fishing vessels all take a toll on turtle populations. Something as simple as floodlights on a beach house can disorient turtles—adults and hatchlings. And that is but a start. So the bottom line is simple. The little tykes need all the help they can get. 7:30 August 22, 2013. Time to inventory two nests. A soft summer evening isn’t the worst time to liberate baby turtles. For one thing the sand isn’t as hot. For another evening is nigh and darkness increases their chance of evading predators. Wearing latex gloves and a blue turtle team t-shirt and cap Mary Alice carefully digs into the nest. A mix of hatchlings and spent eggs come out slowly. Hatchlings go into a bucket. When all hatchlings are accounted for, all eggs, hatched or not, go back into the nest and are covered up. One nest about twenty yards from Mary Alice’s nest yields one hatchling; Mary Alice’s gives up fourteen babies; all go into a fire-engine red bucket. A team member draws two lines in the sand, the corridor down which the baby turtles will crawl seaward. No one can cross these lines. 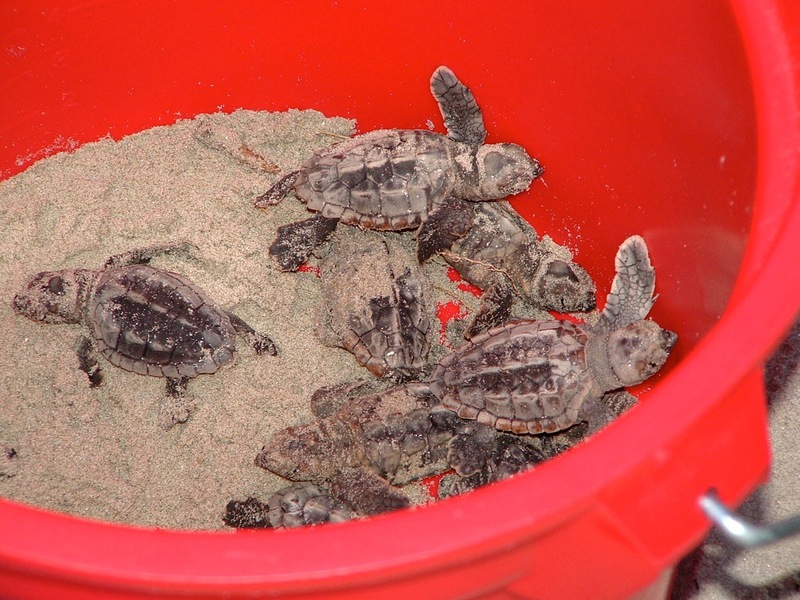 The bucket of babies is gently laid over and out scramble the latest generation of sea turtles. Down toward the water they go. Despite the helping hands that point them seaward the odds aren’t good. Just one in every 1,000 babies will make it to adulthood. Fifteen turtles is a sobering number to reflect on. When the last baby turtle slips beneath a small wave a lot of worrying begins. Uncertainty abounds. When Caretta caretta, as the loggerhead’s scientific name goes, enters the sea it becomes a mystery for ten years or more. Experts don’t know for sure but they believe loggerheads live for sixty or more years. No one knows a whole lot about the turtles until they grow to “plate” size. 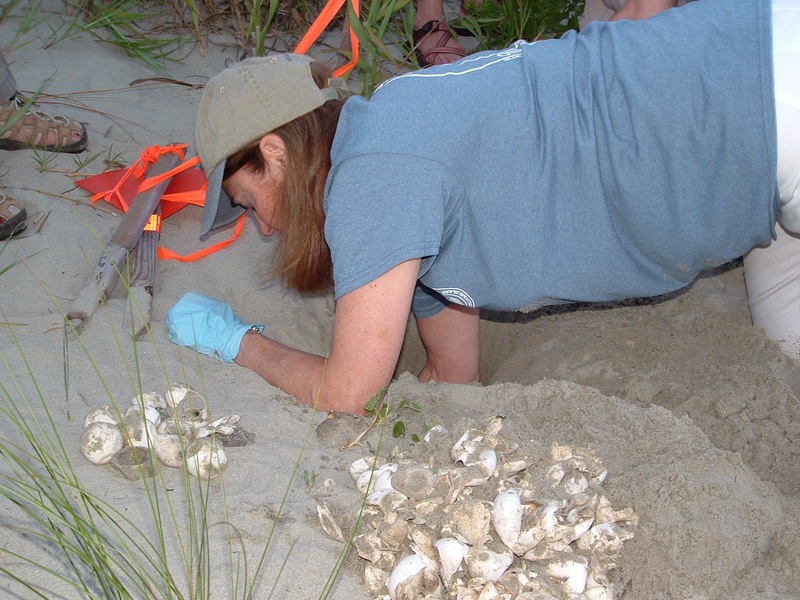 Mary authorizes seven other individuals, including Mary Alice, to perform duties that include identifying and marking nests, inventorying nests three days after emergence and recovering hatchlings. They also collect one eggshell from each nest for genetic research. Ghost crabs and fire ants … Like I said the little tykes need all the help they can get. 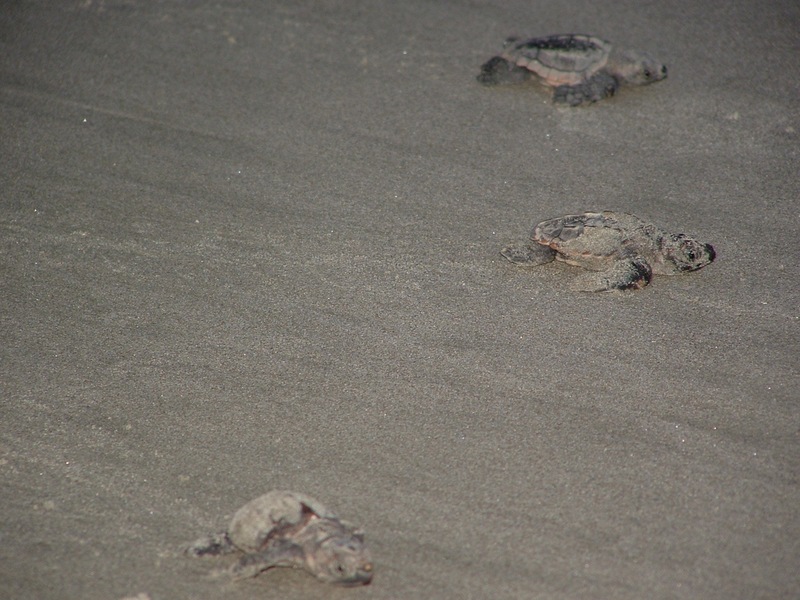 It was exciting and a bit sobering to see the baby turtles slip beneath the Atlantic one by one. When the waves wash over them they’re on their own and all we can do is to wish them a lot of luck. The last scene in Sand Dunes: Guardians of the Coast was to do just this: show a scattering of baby sea turtles making their way to the surf line. There the waves would toss them back time and time again but resolute they’d persist until the sea covered them. Closing credits would crawl over this timeless struggle, the desired end of the nesting cycle. By now though you know that scene went wanting. It was thirty-three years ago when I filmed the nesting turtle on Cape Island, and since thirty years must pass before a female sexually matures and can lay eggs of her own, I’m curious. Did the one in a 1,000 survivor of those eggs I filmed lay the eggs Mary Alice so carefully handled? The turtles that just slipped into the sea. Were they the grandchildren of the turtle I filmed so long ago? It’s a slim chance but not out of the realm of possibility. “Natal homing” holds that a turtle will nest within 5 to 35 miles of where she herself hatched, and Cape Island is pretty close as the turtle swims. The film, in my mind, was now complete, and the hatchlings? They face much adversity. Let’s hope fate gives them every break possible.